斎藤 英雄, 木村 誠, 矢口 悟志, 稲本 奈穂, "射影幾何に基づく多視点カメラの中間視点映像生成", Vol.43, No.SIG 11(CVIM 5), pp.21-32, 2002. *1:T. Beier, S. Neely, "Feature-Based Image Metamorphosis", Proc. SIGGRAPH'92, pp.35-42, 1992. 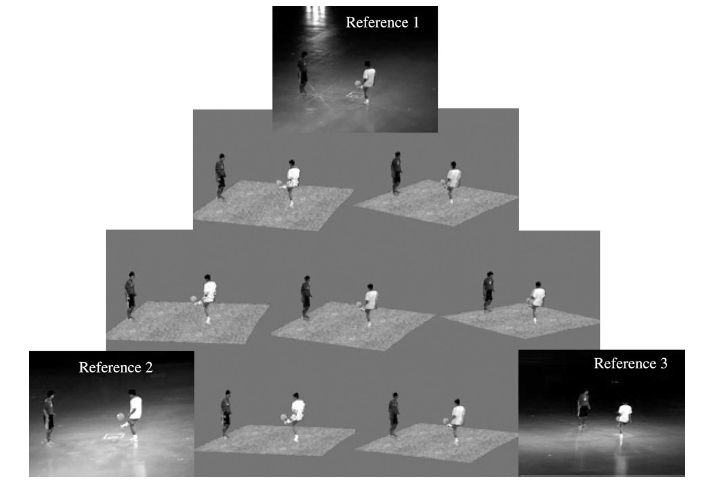 *2:S. Chen, L. Williams, "View Interpolation for Image Synthesis", Proc. 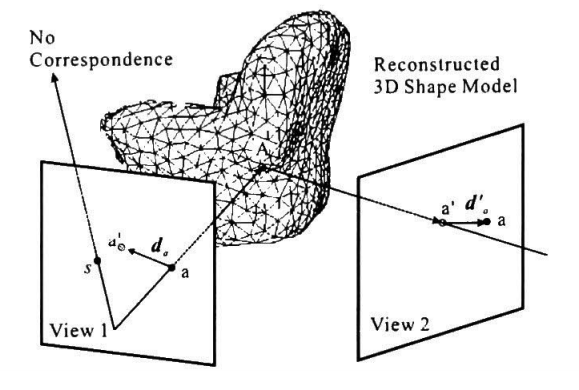 SIGGRAPH'93, pp.279-288, 1993. *3:A. Laurentini, "The Visual Hull Concept for Silhouette Based Image Understanding", IEEE Trans. Pattern Analysis and Machine Intelligence, Vol.16, No.2, pp.150-162, 1994. H. Saito, "Recent Advance of Free-view Movie Generation from Multiple View Images", IEEJ Transactions on Electoronics, Information and Systems, Vol.121, No.10, pp.1493-1499, 2001. 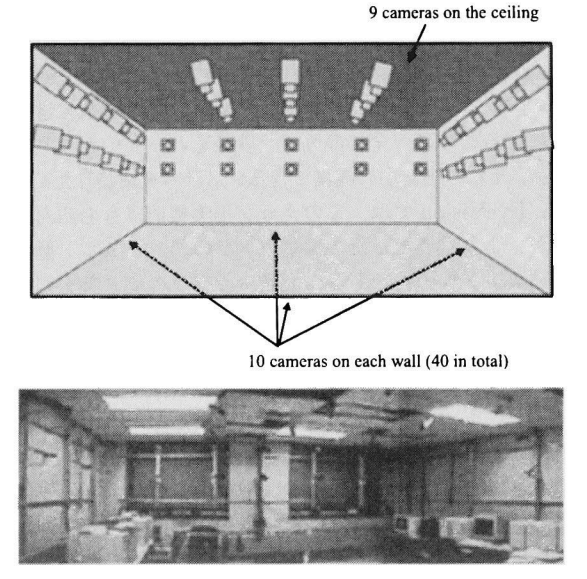 *1:T. Kanade, H. Saito, S. Vedula, "The 3D Room: Digitizing Time-Varying 3D Events by Synchronized Multiple Video Streams", CMU-RI-TR-98-34, 1998. *2:M. Okutomi, T. Kanade, "A Multiple-Baseline Stereo", IEEE Trans. on PATTERN ANALYSIS AND MACHINE INTELLIGENCE, Vol.15, No.4, pp.353-363, 1993. *3:S. Vedula, P. W. Rander, H. Saito, T. Kanade, "Modeling, Combining, and Rendering Dynamic Real-World Events From Image Sequences", Proc. 4th Conf. Virtual Systems and Multimedia, Vol.1, pp.326-322, 1998. *4:H. Saito, S. Baba, M. Kimura, S. Vedula, T.Kanade, "Apperance - Baced Virtual View Generation of Temporally-Varying Events from Multi-Camera Images in 3D Room", Second International Conference on 3-D Digital Imaging and Modeling (3DIM99), October 4-8, pp.516-525, 1999. *5:A. Katayama, K. Tanaka, T. Oshino, H. Tamura, "A view point dependent stereoscopic display using interpolation of multi-viewpoint images", SPIE Proc. Vol.2409, Stereo scopic Displays and Virtual Reality Systems II, pp.11-20, 1995. *6:M. Levoy, P. Hanrahan, "Light Field Rendering", Proc.SIGGRAPH'96, 1996. *7:S. J. Gortler, R. Grzeszczuk, R. Szeliski, M. F. Cohen, "The Lumigraph", Proc. SIGGRAPH '96, 1996. *8:S. Chen, L. Williams, "View Interpolation for Image Synthesis",Proc. SIGGRAPH'93, pp.279-288, 1993. *9:T. Werner, R. D. Hersch, V. Hlavac, "Rendering RealWorld Objects Using View Interpolation", In IEEE Int'l Conference on Computer Vision: ICCV95, pp.957-962, 1995. 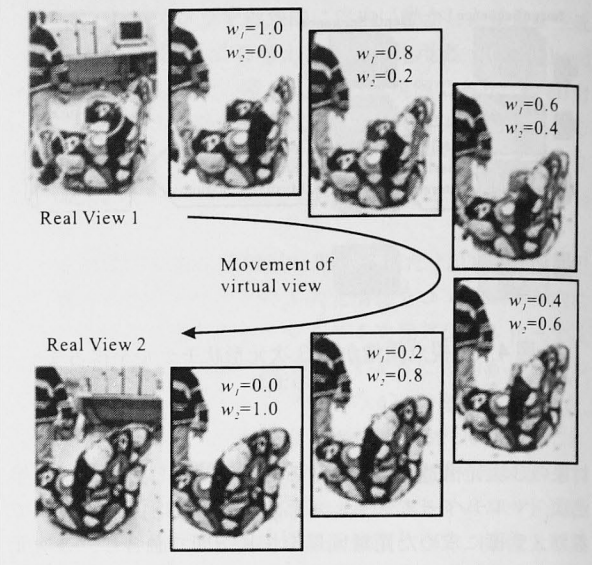 *10:S. M. Seitz, C. R. Dyer, "View Morphing", Proc.SIGGRAPH '96, pp.21-30, 1996. *11:T. Beier, S. Neely, "Feature-Based Image Metamorphosis", Proc. SIGGRAPH '92, pp.35-42, 1992. *12:R. Tsai, "A Versatile Camera Caribration Technique for High- Accuracy 3D Machine Vision Metrology Using Off-theShelf Tv Cameras and Lenses", IEEE Journal of Robotics and Auto mation RA-3, 4, pp.323-344, 1987. 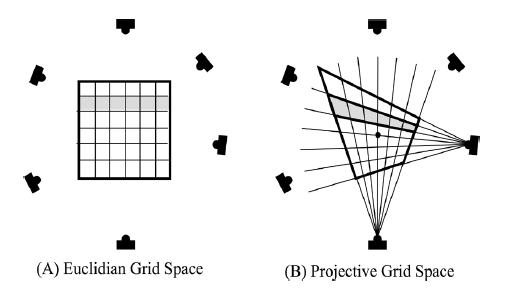 *13:H. Saito, T. Kanade, "Shape Reconstruction in Projective Grid Space from Large Number of Images", IEEE Proc. 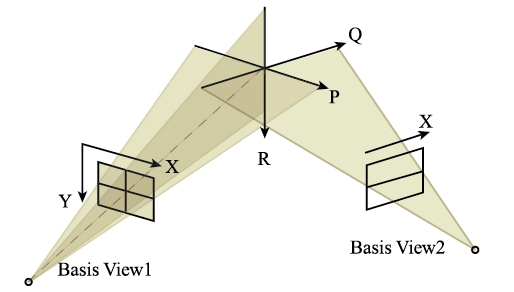 Computer Vision and Pattern Recognition, Vol.2, pp.49-54, 1999. *14:矢口 悟志, 木村 誠, 斎藤 英雄, 金出 武雄, "未校正多視点カメラシステムを用いた任意視点画像生成", 情報処理学会論文誌:コンビュータビジョンとイメージメディア, Vol.42, No, SIG 6 (CVIM). pp.9-21, 2001.